We are pleased pleased to announce a new maintenance release of AppMarket. Release 2.0.2 solves issues reported by the community and has been verified to work with OpenNebula 4.8. This release is part of the AppMarket 2.0.x series, which extended the AppMarket functionality by adding a new set of features that enables the management and processing of OVA files. A new component AppMarket Worker was introduced, which handles the OVA package treatment (download, unpack, OVF parsing) and image format conversion. This release also featured a new API, a new simplified import dialog, a new AppMarket interface via Sunstone, and handles VMware and VirtualBox OVAs. Please consider that, although AppMarket is widely used by the OpenNebula users, this software has not gone through the same rigorous testing process as the main OpenNebula distribution. Read more about the AppMarket 2.0.x series. https://opennebula.org/wp-content/uploads/2018/11/opennebula_cloud_logo_white_bg-4.png 0 0 Daniel Molina https://opennebula.org/wp-content/uploads/2018/11/opennebula_cloud_logo_white_bg-4.png Daniel Molina2014-09-19 11:15:422014-09-19 11:15:42AppMarket 2.0.2 Released! The next OpenNebula TechDay will be a joint event with CentOS Dojo to be held in Timisoara (Romania) on the 26th and 27th of September. The event will start on the 26th at 15:00 with a OpenNebula on CentOS Hands-on tutorial and will continue on the 27th with a CentOS Dojo that will include presentations by OpenNebula users and experts. Notice that you have two different registrations, one for the OpenNebula Hands-on Tutorial on the 26th and other for the CentOS Dojo on the 27h. The event will be hosted by cloudbase and UnifiedPost, a big thanks to making the OpenNebula Tech Day possible. We hope see you there! The results of this survey were collected during July and August of 2014 from the OpenNebula open source cloud management platform community with regards to the type of cloud deployment and its main architectural components. The aim of the survey is to acquire information in order to improve the support for the most demanded infrastructure platforms and deployments. Since the foundation of the open-source project in November 2007, OpenNebula has been downloaded more than 200,000 times from the project site (120,000 times since our last survey in September 2012), not including other software repositories or third-party distributions. 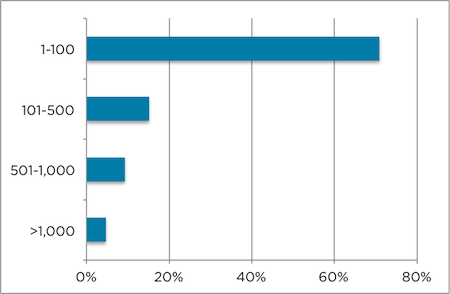 Regarding the use of OpenNebula, the Survey shows that 42% of the deployments are in Industry and 14% in Research Centers. 74% of the organizations are in Europe, Russia or USA. 88% of the respondents use OpenNebula to build a private cloud. 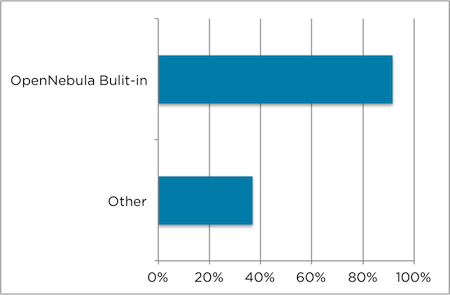 When asked about the type of workload, 62% said that they use OpenNebula for running production workloads. Regarding the size of the clouds, 10% of the deployments have more 500 physical nodes. 44% of the deployments consist of more than one OpenNebula zone and 4% are running more than 10 zones. One of the companies reported a workload of 200,000 VMs. Among the advanced components offered by OpenNebula, High Availability, with 67%, is the most widely used or planned to use, which is closely aligned with the top usage of OpenNebula in production environments. 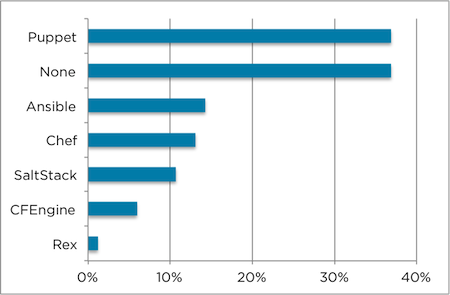 Regarding the building blocks of the cloud, KVM at 48% and VMware at 30% are the dominant hypervisors, and CentOS at 46% and Ubuntu at 36% are the most widely used linux distributions for OpenNebula clouds. 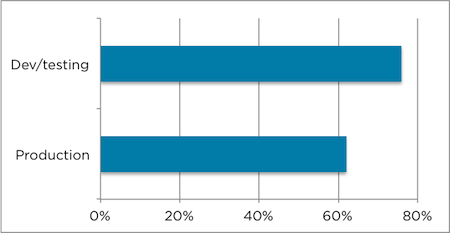 The preferred choices for the storage back-ends are shared FS and SSH with a 52% and 36% ratio respectively. The most widely used Configuration Management Systems are Puppet and Ansible with a 37% and 14% respectively. 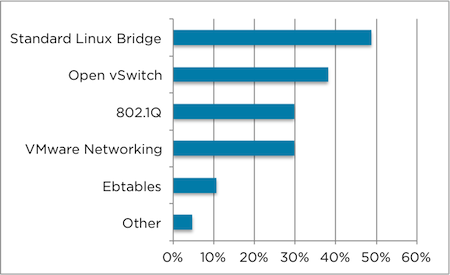 Regarding networking, most of the deployments, a 49%, use the Standard Linux Bridge for network configuration, 38% use Open vSwitch, and 30% use 802.1Q. In comparison to the previous survey findings in 2012, the relevant changes are that CentOS has displaced Ubuntu as the most widely linux distribution to build OpenNebula clouds, and a growth in the number of production deployments from 42% to 62% and in the number of public clouds that has doubled from 21% to 40%. Although more than 2,000 users took part of the survey, we have only included in the analysis those respondents using OpenNebula 4.x (latest series) and who we deem reliable because they have provided identification details that allow us to verify the answers of the survey. This is important given that our main aim is to have accurate and useful information about OpenNebula deployments. 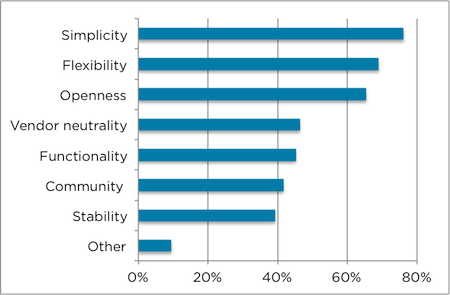 Last, but not least, when asked about what you like most about OpenNebula, most users, a 76%, answered because of its simplicity, and 69% and 65% answered because of its flexibility and openness. These results are aligned with our our mission — to become the simplest cloud enabling platform — and our purpose — to bring simplicity to the private and hybrid enterprise cloud. OpenNebula exists to help companies build simple, cost-effective, reliable, open enterprise clouds on existing IT infrastructure. BIG THANKS to all the organizations that have contributed to the survey! 42% of the respondents indicated that they work for industry, while 14% work for research centers. 54% of the deployments are in Europe and Russia. This means a small increase compared with previous survey where the number of deployments in Europe and Russia was 49%. 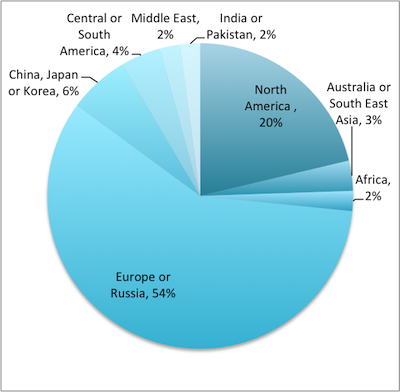 80% of the respondents are located in Europe, Russia, North America, China, Japan or Korea. 63% of the organizations are small companies with fewer than 100 employees, and only 5% has more than 10,000 employees. 88% of the respondents are running a private cloud for internal operations, while 40% are running a public cloud to offer utility services. Compared with 2012, the number of public clouds has doubled from 21%. This is aligned with the quickly growing number of hosting companies that are adopting OpenNebula to offer cloud services. 76% of the respondents are running a non-critical environment or peripheral installations for running testing or development applications, while 62% are using the cloud for running production workloads. The number of production deployments has grown from 42% in 2012. The number of users in most of the clouds, a 71%, is fewer than 100. Many of these deployments use OpenNebula as virtual data center infrastructure manager and not as a cloud provisioning platform. 52% of the OpenNebula deployments have more than 10 nodes, and 10% of the deployments have more than 500 physical nodes. The number of very large-scale deployments has slightly fallen from 13% achieved in 2012. 44% of the deployments consist of more than one OpenNebula zone, and 4% are running more than 10 zones. 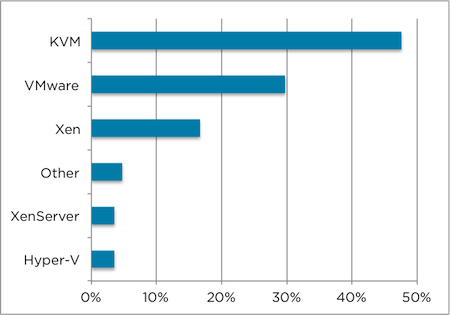 KVM at 48% and VMware at 28% are the most widely used hypervisors. Next one is Xen at 11%. 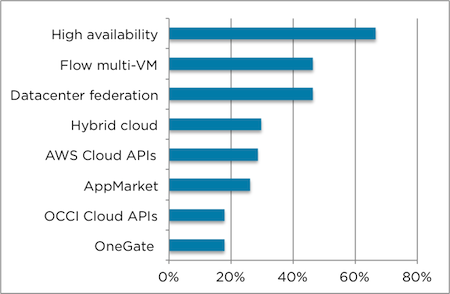 Hyper-V and Xen Cloud Platform usage has fallen from a 11% in 2012 to a 4%, mostly because these two hypervisors are not supported by the OpenNebula distribution. They can be used through community plugins. 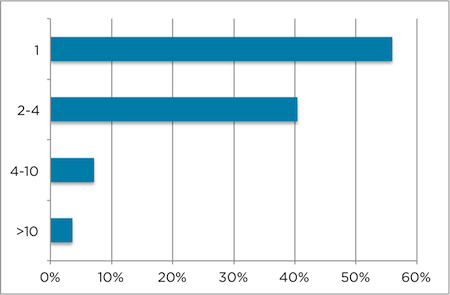 52% of the OpenNebula deployments use a shared file system; 36% of users use the ssh datastore; 30% use VMware FS; and 42% of the users use a block device architecture based on LVM or iSCSI. 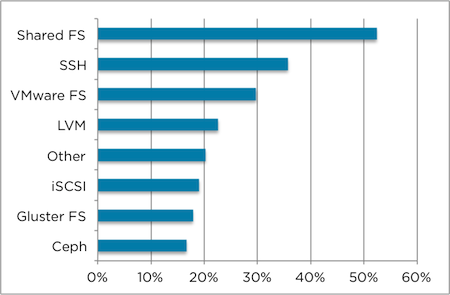 GlusterFS and Ceph are used by 18% and 17% of the organizations respectively. 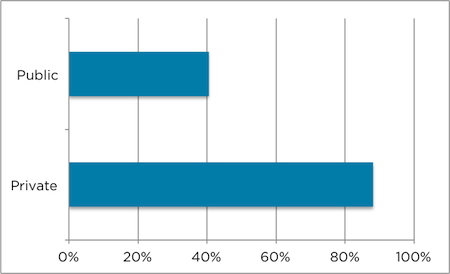 Most of the deployments, a 49%, use the Standard Linux Bridge for network configuration; 38% uses Open vSwitch; and 30% uses 802.1Q. 92% of the clouds use the monitoring system provided by OpenNebula, and 37% use a third-party monitoring system. 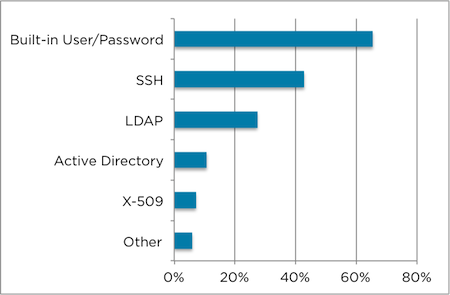 Regarding authentication, most of the organizations, a 65%, are using the built-in user/password system, while SSH and LDAP, with 43% and 27%, are the more popular external authentication systems. 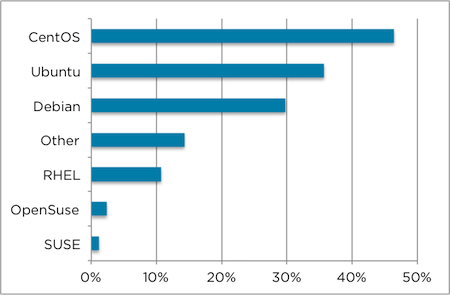 CentOS at 46% and Ubuntu at 36% are the most widely used linux distributions for building OpenNebula clouds. 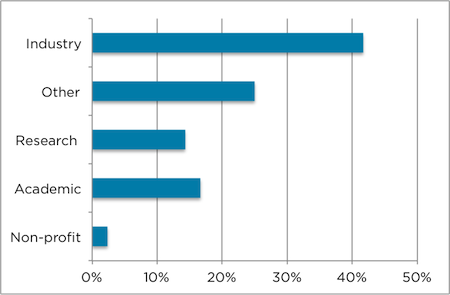 In the previous survey in 2012, Ubuntu was the most widely used with a 31%. Notice that in this last survey we allowed respondents to select more than one operating system. 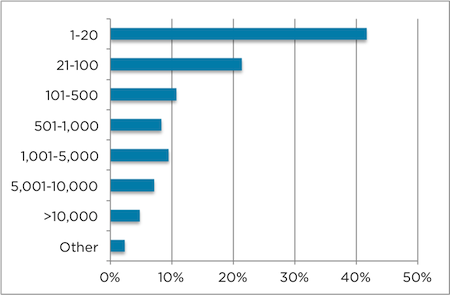 Puppet is used by 37% of the OpenNebula users. 37% have reported that they do not use any Configuration Management Systems (CMS) as the existing OpenNebula contextualization system and cloud-init support meet their needs. Ansible ,with a 14%, is the next popular CMS within the OpenNebula community. Among the advanced components offered by OpenNebula, High Availability, with a 67%, is the most widely used or planned to use. Flow multi-VM and DC federation are the next features with a 46%. Basically OpenNebula is used for its simplicity, flexibility, and openness. Last year, we launched the very first OpenNebula Conf in Berlin Germany. At our debut, we could welcome an international audience of people from 12 different countries, had experts from companies like BBC, the European Space Agency (ESA) or Centos and could offer three fully packed days of tutorials, workshops and talks about OpenNebula to our guests. This year, the OpenNebula Conf will take place again at the cosmopolitan city of Berlin and we would like you to be part of it! Alongside with our partner LINUX Magazine, covering the events international media marketing, we want you to be part of our team of sponsors and profit from OpenNebula Conf’s popularity as a supporter of the event. This year’s OpenNebula Conf will take place from December 2nd to 4th in Berlin Germany. The international attendees are open source interested and known as a highly networked target group which acts as a multiplier. We have created a new user survey that will take you only 5 minutes to complete. As an open-source community, it is very important for us to have information about your deployment. Doing so you will have influence over the project and software direction, and will help us improve the support for most demanded infrastructure platforms and configurations. This summer month of August has been the host for the new, shiny and latest release of OpenNebula: 4.8 Lemon Slice. Did you try it out? We would love to hear your feedback, so we have time to include possible changes in the next maintenance release. You can reach us through the user mailing list, give it a spin! This new version of OpenNebula comes with several goodies that we would like to highlight. Sticking with our vision of bringing simplicity to cloud management, this release comes with improvements in the recently added Cloud View portal, now with the ability to control flows, as well with a new interface designed for Virtual Datacenter administrators (VDCAdmin View). Another important addition happened in the domain of cloudbursting: support for two new public cloud providers (Microsoft Azure and IBM SoftLayer) has been added, widening the range of possibilities to offload VMs in case the local infrastructure is saturated. Moreover, Virtual Networks underwent a thorough redesign, now their definition is no longer restricted to the fixed and ranged model, but rather they can include any combination of ranges to accommodate any address distribution. Dig in to see all the nuts and bolts! “OpenNebula 4.8 is helping us fulfil one of the most important needs of our users: a simple and unified deployment cycle in all of our environments, including a transparent hybrid cloud integration with the main public cloud providers. I would like to thank C12G for their Fund a Feature program,” said Daniel Concepcion, IT Managing Director at Produban. So now is time to stand back and let you ride the Lemon Slice, let us know how is doing. Meanwhile, we will be busy (as always!) carefully planning the roadmap for the next stable release (yes, we are relentless!). Curious on how we define the roadmap? Take a look at this page, where you can also find how to contribute to the list of features that will be tackled in this next release. Even for a traditionally quiet month as it is usually the case with August, the OpenNebula community hasn’t stop buzzing. It’s really nice to have you there folks. A nice OpenNebula Cookbook for Chef was released by Vaamo. These recipes go a long way for deploying and setting up a cloud infrastructure based on OpenNebula. 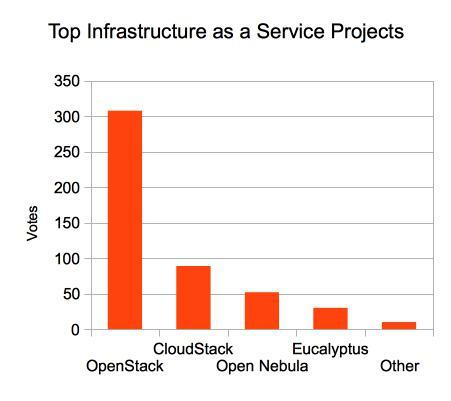 It is worth also pointing out that OpenNebula scored 3rd in the Top IaaS Open Source projects, in a survey conducted by The New Stack and Linux.com, as presented recently in the CloudOpen in Chicago. We want to point out that, according to this, OpenNebula is also the 1st vendor-free IaaS Open Source project, as well as the 1st non-US project of its kind. Way to go OpenNebulers! It is also nice to become aware of more business powering their solutions with OpenNebula. And if they top it with an explanation of why they chose your favorite CMP, then kudos and let us wish all the best. The community being great can also be deduced from excellent posts such as the one by AZNS, covering with great detail the datacenter federation capabilities of OpenNebula, including internal design, deployment recommendations and, overall, perfectly grasping the philosophy of this new feature. Feedback from the community has started trickling. And seriously, we want to thank all of you for this, it is an essential part of the process that makes OpenNebula a mature technology as it is today. For instance, we love to be aware of any member of the community becomes aware of a new functionality (we blush!) , but, even more than this, we appreciate all the detailed bug reports done through any of the channels, being Twitter, the OpenNebula users mailing list and the development portal. Also, extensive testing and benchmarking as performed by key members of the community is more than welcome, keep it up! 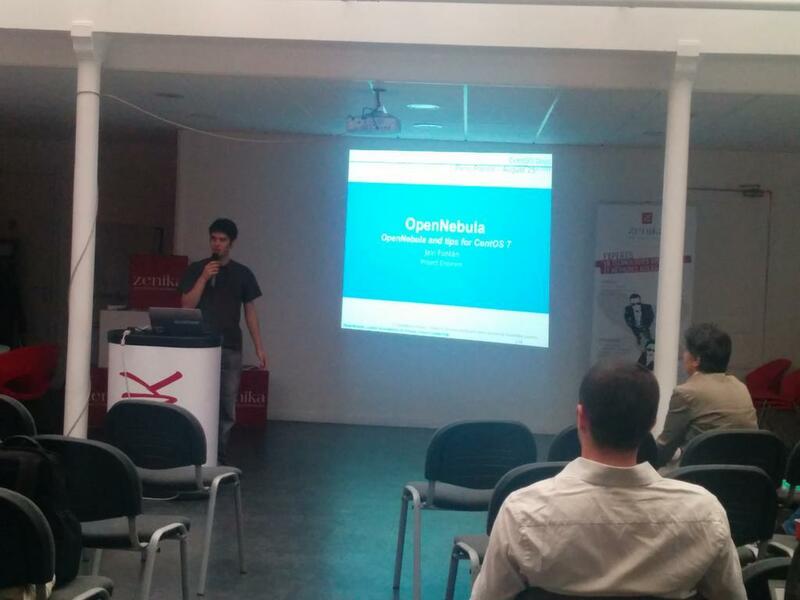 Members of the OpenNebula team participated in August in a Centos Dojo in Cologne. Also, a Centos Dojo was held in Paris, and we also participated there. Check out what went on on those events. We have upcoming TechDays in future months, if you are interested in OpenNebula you can check the project page to find out if we are travelling somewhere near you: Timisoara, Barcelona, Chicago, Aveiro, Munich … and many more to come! As a bonus, both the Timisoara and Barcelona TechDays will be jointly held with the CentOS Dojo.